The ‘Lakeland Walker’ short break is an ideal choice for those wanting to get away from it all and enjoy being in the heart of the Cumbrian fells. 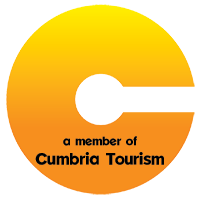 Accommodation will be in a comfortable guest house in the heart of Keswick on a bed and breakfast basis. Rooms will be en-suite or with private bathroom. Included in the holiday package are morning transfers to the start of your walk and each walk finishes in Keswick. On each day you can choose between a moderate walking route and a more demanding option taking in several fell tops. The start of both options for the day will be the same so you can mix and match and simply decide which one to follow depending on how you feel when you get up! Depending on your time of arrival, there are a number of interesting circuit walks you can take from Keswick ranging from from 1 to 7 miles. Visiting the viewpoint of Castle Head or an ancient Stone Circle below Blencathra, or making an ascent of Catbells are all possible if you arrive with an afternoon to spare. Close to your accommodation is Hope Park with its pitch and putt and crazy golf courses, bird hide and gardens. A walk through the park brings you to the lake shore where the Keswick launch departs for cruises on the lake. Keswick has many pubs and restaurants and a nightclub. It also has a theatre, a cinema and even a pencil museum! Your private transport will collect you from your accommodation and take you over Honister Pass to the attractive hamlet of Buttermere nestled between two lakes. You can visit the lake shore before setting off on the day's walk which begins with a walk along Mill Beck. Gaining height gradually, you continue along Sail Beck before climbing up to a saddle or col between Sail Fell and Ard Crags, your high point of the day at 1530ft. Now descending Rigg Beck, you enter the picturesque Newlands Valley and continue down to Skelgill where a short stretch of quiet road leads to Hawse End on Derwentwater. You have the option to take the launch across Derwentwater back to Keswick (fare not included), or continue for a further mile through woodland to Nichol End Marina. Here you have another opportunity to take the launch back to Keswick or you can continue through the village of Portinscale where you cross the river on a suspension footbridge and cross fields to reach Keswick (1.5 miles from Nichol End). 9 miles. 1800ft ascent / 1930ft descent..
From Buttermere Village you begin by climbing the broad flanks of High Snokrigg as tremendous views over the lakes of Buttermere and Crummock water open up behind you. You continue the climb to the summit of Robinson (2417ft.) and then follow Littledale Edge around the Cwm of Deep Gill to Hindscarth (2385ft.). Descending the delightful NE ridge over Scope End you have beautiful views over Newlands, eventually reaching its small church, where you join the road for a short way to Little Town. From here an old quarry road provides easy walking along the valley to Skelgill and from this point you follow the same route as for the above option back to Keswick. 10 miles. 3200ft ascent / 3330ft descent. Your private transport will collect you from your accommodation and take you along the shore of Bassenthwaite Lake to Ravenstone below Raven Crag. A short sharp climb from here gets you up to 'The Edge', the narrow North ridge of Ullock Pike. Now a steady climb with ever expanding views takes you to the summit at 2230ft. Delightful ridge walking continues along Longside Edge to Long Side (2405ft.) and on up to the high point for today's walk at Carl Side summit (2420ft.). A descent southwards with glorious views ahead brings you to the waterfalls of Millbeck. Finally, quiet country lanes and the 'Allerdale Ramble' footpath through the fields of Ormathwaite take you back to Keswick. 6½ miles. 2385ft ascent / 2470ft descent. Skiddaw (3053ft.) is England's 4th highest mountain and is Keswick's very own fell, dominating the town. For many, an ascent of this slate-built giant is a must on any visit to North Lakeland. However, much better than joining the crowds on the Tourist Track is this route which begins as for the moderate option above, climbing Skiddaw from the col between Long Side and Carl Side. Needless to say from such a lofty vantage, the views in all directions are superb. The descent can be made more entertaining by climbing Skiddaw Lower Man on the way down and you finish on a lovely track following the edge of woodland around Latrigg. 7½ miles. 3100ft ascent / 3185ft descent. 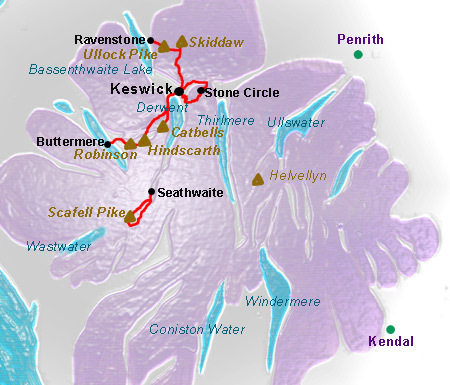 Keswick is also a suitable base for an ascent of Scafell Pike, England's highest Peak. This option (which is harder than any of the above walks) can be substituted on either of the main walking days with advance notice. There is an extra charge of £40 in total for up to 4 persons for this option to cover the additional transfers, map and route cards required. 8 miles. 3200ft ascent / descent..
As keen walkers ourselves we appreciate the importance of the place you put your feet up and rest your head in at the end of each day. Your accommodation for this holiday is a comfortable hotel or guest house in the heart of Keswick. All our accommodation has en-suite bathrooms for twin or double share. Single occupancy of rooms is also available for a supplementary cost. Breakfasts are provided by your accommodation. Keswick has many excellent restaurants and pubs and our extensive notes will help you choose the best place to suit your taste and budget for your evening meal. For lunch your accommodation will be able to prepare a packed lunch for you if ordered the evening before. There are also several sandwich bars in the town and several supermarkets.